The Gold American Buffalo Proof 70 coin is an exquisite piece of modern American coinage, touting not only exceptional investment significance but historical impact and artistic excellence, as well. After the passing of what’s known as the Presidential $1 Coin Act in December of 2005, the Gold American Buffalo series was officially born. It was conceived as the first-ever 24-karat gold coin struck and issued by the U.S. Mint for public consumption, which was a direct result of the American market’s demand for an exceedingly pure domestic gold piece that would compete with Canada's Maple Leaf series. Since its inception, the Gold American Buffalo has proven year over year to serve as an excellent store of value, and reliable hedge against turbulence felt in other areas of the economy. 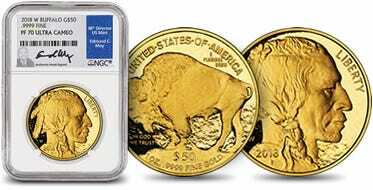 While 2018 Gold American Buffalo Proof 70 coins do carry denominations of $50, their real value stems from the pieces’ highly pure gold contents. Thanks to its rigorous, multi-step production process, the 2018 Gold American Buffalo boasts an exquisite, mirror-like finish and highly defined images. The Gold American Buffalo design recalls the artistry of Pre-1933 U.S. coinage by employing James Earle Fraser’s original 1913 Type I Buffalo nickel obverse and reverse designs. In likeness of the 1913 nickel, the 2018 Gold American Buffalo prominently features a male Native American figure on the obverse, with two feathers tied into his long hair. In the top right “corner” appears the word “LIBERTY,” and the mintage year, “W” mintmark indicating production at the West Point Mint, and a single “F” representing the original designer’s name, Fraser, are inscribed in the bottom left area. On the reverse appears the renowned and much-loved symbol of America, the bison, grazing atop a grassy patch of land. The words, "UNITED STATES OF AMERICA" line the top edge of the coin while the country's motto, "E PLURIBUS UNUM" is inscribed in three single-word lines below. "IN GOD WE TRUST" appears in the bottom left area of the coin, along with the piece's $50 face value and "1OZ. .9999 FINE GOLD" contents toward the bottom center. First ever 24-karat gold coin struck by the U.S. Mint for public investments. Pre-1933 Type I Buffalo nickel design replicated on the coin’s obverse and reverse. 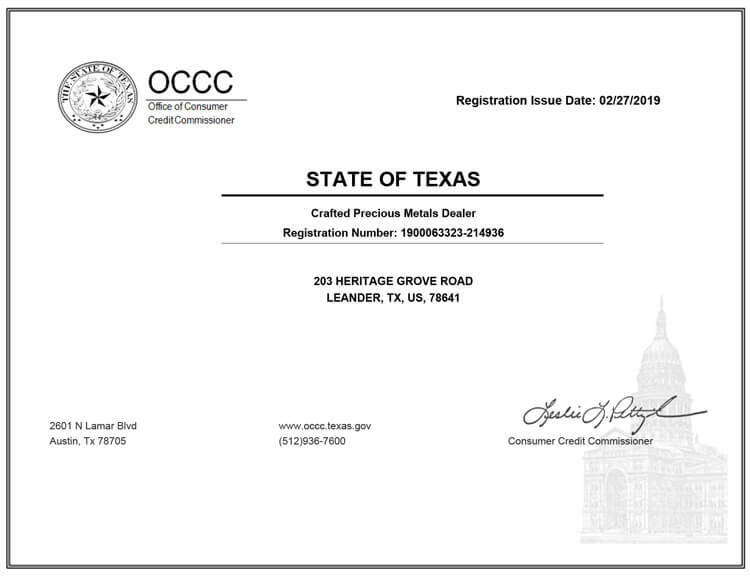 Proof 70 grade granted by the Numismatic Guaranty Corporation (NGC), officially deeming the coin to be of perfect quality. 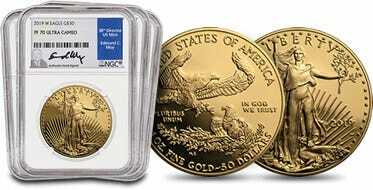 Coin contains 1 Troy ounce of .9999 fine gold, placing them amongst the world's purest gold coins. Measures 32.7mm (1.287in) in diameter and 31.108g in weight, making it easy to handle, transport and store. Why should I invest in this? The Gold American Buffalo is a unique piece offering not only high investment value but historical significance, as well. The 2018 version of the U.S.’s first-ever public-issued 24-karat gold coin carries a top-ranking grade of 70 from the Numismatic Guaranty Corporation (NGC). Proof 70 coins are the highest quality coins available on the market today, giving them a competitive edge over lesser quality pieces. A grade of 70 is difficult to obtain, and only a tiny portion of Proofs are deemed worthy of carrying it. These persistently low numbers allow the population of these gold coins to remain small, further adding to clout, value, and significance. Additionally, Wholesale Coins Direct is proud to offer our clients a one-of-a-kind opportunity to elevate the worth of their 2018 Gold American Buffalos even further. 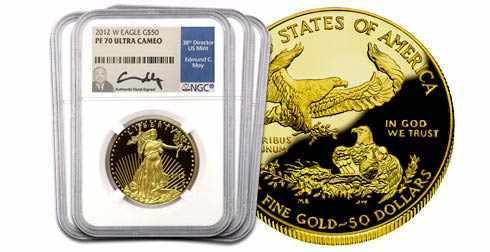 All of our Proof 70 coins are accompanied by a certificate of authenticity that has been hand-signed by Ed C. Moy, former Director of the U.S. Mint. This unique feature is available exclusively through Wholesale Coins Direct and has historically proven to be a significant value-add, with projections to continue its impact for many years to come.